Buy your Cream soup bases from the restaurant supply superstore. It is quicker and easier to make custom soups by starting with a cream base than from scratch so most chefs prefer this method. They turn out equally delicious. 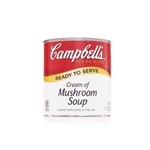 Campbell's At Hand Creamy Tomato Soup 10.75 Oz. 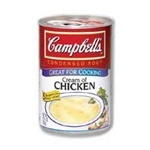 Campbell's Cream Of Potato Condensed Soup 50 Oz. Custom Culinary Masters Touch Cream Soup Base - 28 Oz. Custom Culinary Masters Touch Instant Cream Soup Base - 20 Oz. Hormel Cream Soup Mix Reduced Sodium - 32 Oz. Precision Foods Tuf Instant Cream Soup Base - 28 Oz. Legout Cream Soup Base - 25.55 Oz. Legout Cream Soup Base Pail - 22.5 Lb. Cream Soup Base B Type - 28 Oz. Buy wholesale Bulk Cream Soups for restaurants, buffets and soup bars to make custom sauces, soups and dishes in your food service establishments. Perfect food ideas for the cold weather months.